Will Kansas Governor Be Dems VP Candidate in 2008? Among the many businesses that thrive in the hustle and bustle of downtown Lawrence, Kansas, few seem odder than the Surf Shop—a hole-in-the-wall nestled across from clothing stores, restaurants and various gimmicky gigs. Kansas, someone forgot to mention to these folks, is at the geographic center of the United States—and the nearest surf-worthy body of water, the Gulf of Mexico, is a couple thousand miles away—requiring, by any estimation, an unpleasant trek across Texas. How, many must wonder, does a surf shop stay in business here, in a state with plenty of wind but barely enough water to water all the livestock and artificially green lawns? Equally strange, however, would be anything stereotypically having to do with Kansas—say, a Farm Implements Extravaganza or, HickWear Penny’s—turning up in the Bay Area. Someone from Kansas, however, who might soon be appearing in every possible un-Kansas sort of place nationwide is the state’s soft-spoken, tough-woman governor, Kathleen Sebelius. Though far too early for anything but speculation, rumors of her potential place on the 2008 Democratic Presidential ticket as a Vice Presidential nominee are flying like bats (though probably, they are flying fastest in places far from the dry shores of Kansas, such as, say, the Internet and Bay Area BART stations). The rumors, however, if they haven’t already, ought to be taken seriously by those interested in a Democratic president come 2008. Governor Sebelius, who was crowned one of the top five governors nationwide last year by Time Magazine, entered the world of politics at birth. Her father, whom she visits frequently in her hometown of Cincinnati, is popular former Ohio Governor John Gilligan. A resident of Kansas since 1974, she served as a state legislator for 8 years, before becoming Kansas’ first female Insurance Commissioner—a job she held for another 8 years—before being elected the 44th Kansas Governor in 2002 (though not as the first woman governor of the state). Briefly mentioned in 2004 as a potential running mate for John Kerry, one wonders how she—being, first of all, a she—got elected in a state not known, at least in modern times, for any particular feminist, or even Democratic, leanings. The answer, in short, is precisely because of her unassuming, yet direct and highly un-politician-like air—something reminiscent, in fact, of a certain former governor of Texas. Enough Kansans—even many of the conservative ranch-types—trusted her in a critical election for the state (2002), and her re-election prospects in November look bright. How is this possible? Last week I posed that exact question to Sebelius: how was it that she managed to become governor here, in red-state Kansas? “Putting the people of Kansas before anything else was my commitment when I ran for Governor,” she explained. And, you are saying, this sounds like just another one of the vague platitudes of a politician, right? But there’s more: “I’m dedicated,” she went on, “to…a commitment to accountability. I believe a good idea can come from anywhere, and strong leaders listen at least as much as they talk. Not only has she won over the everyday people of Kansas, but Sebelius has garnered the trust of much of the business community as well, if only for her knowledge of economic affairs from first hand experience that is rare for a governor. As Insurance Commissioner for eight years, she encountered the economic needs of small businesses and large ones, as well as consumers state-wide. For most small business owners in particular, this provides extra reason for them to trust her judgment as chief executive of the state. She is not, however, some corporate lackey. And her words on accountability and leadership would fade away as some sort of smokescreen if they weren’t backed by a concerted effort on key issues—issues that make her a staunch Democrat, as well. On healthcare, for instance, the Governor has led the charge in slashing through bureaucratic waste. Sebelius specifically targets the 30 cents per every dollar spent by Kansans on health which goes to such administrative costs—i.e. paperwork, HMO bureaucracy and inefficient efforts at accountability. And can a good idea really “come from anywhere?” Sebelius does in fact believe this: she has made good on her promise to provide more affordable healthcare medication in its generic form by eliminating barriers preventing Kansans access to drugs from, say, Canada. These practical, politically appealing policy decisions are present in her education and labor efforts as well. The Governor has allocated, proportionally, one of the largest investments in education funding the state has ever seen. “I believe,” Sebelius, whose two sons are products of the Topeka (KS) public schools, said, “that, for the health of Kansas, nothing is more important than education.” And at last, labor organizers in Kansas have a politician with clout on their side. Last month, Sebelius bravely vetoed an election-year bid by Republican hacks to pass a law that would limit the worker’s compensation threshold by shrinking the definition of “pre-existing condition,” thereby making it increasingly difficult (in an already difficult state) to receive payments for work-related injuries. And, of course, her economic policy—the flagship of her work for which Time bestowed its honor—has been touted nationwide. Since taking office, Kansas has enjoyed 22 months of steady economic growth under Sebelius. She has, with record-breaking efficiency, slashed the state’s deficit without raising taxes, all the while helping to create employment statewide. But would she make a good Vice President? Though you never thought you’d see the day a female governor from Kansas made (and even surfed) national waves, the answer is yes. For those tough, conservative-leaning voters—in the mid-west, as in Kansas—Sebelius would appeal for several reasons. First, she is a governor—thereby equipped with executive skills already (something both Clinton and Bush had in their favor)—and second this puts her outside the infamous “Washington Elite” so dangerous for politicians to be a part of. Additionally, she could bring in these red-state voters by being, at least in terms of location, part of their world—she manages Kansas, after all. And, her father, the Ohioan, could help bring along the oh-so-important swing votes in Ohio. She herself expresses disinterest in the Red State-Blue State dichotomy, though she has already demonstrated her ability to connect with suspicious red-state voters. And yet, for Democrat voting-folks looking for strong political support in a must-win presidential election, Sebelius offers reason to hope here as well. She is as bold—consider her veto of the overwhelmingly politicized Republican push for concealed-gun laws in Kansas last month—as she is solid in her progressive policy approaches (i.e. on healthcare, education, labor, the economy and more). Furthermore, she is pro-choice and anti-capital punishment (and Roman Catholic)—and she has managed to get elected without hiding any of this, here in the same state that houses right-wing nutcase Fred Phelps. Moreover, with the Hillary train gathering steam (something of a Casey Jones suicide run to many party strategists), a Sebelius presence on the Democratic ticket could divert voters eager for a woman to get elected (a worthy cause, no doubt) into a more winnable proposition. 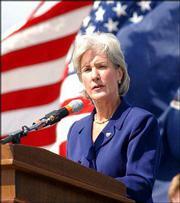 Sebelius herself, of course, is polite but coy about the idea of being a Vice Presidential candidate. “It’s very humbling,” she told me, “that others might see me [as a potential candidate]. But I am squarely focused on leading the state of Kansas.” Still, as unlikely a story as it is so far, it can’t beat the improbability of finding a surf shop in central Kansas. And though the plains aren’t likely to revert back into anything resembling an ocean (or even a large lake) anytime soon, Sebelius may—if she seeks it—have a bright future riding the surf from her office on the prairie all the way to 1600 Pennsylvania Avenue.